Michele is kind of a big deal in the quilting world known as The Pieceful Quilter. 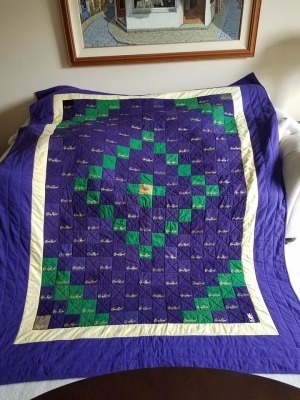 With 25 years of experience and many national awards for her quilts, she wrote a book, has been published over 50 times in various magazines and teaches and lectures all over the country and in Canada. She also designs fabrics for Northcott Silk (a quilt fabric company based out of Canada). It's safe to say that Michele will produce a high quality piece that you will adore. Besides all of this, she is on her 29th year of teaching 4th grade. Tom is a retired high school special education science teacher. He taught (kind of) alongside Michele in the same district, until the two united and got married in 2010. Tom retired June, 2017. He's an amazingly patient and kind man. Then Tom's dad asked them to make a tee-shirt quilt with his Elks' Club shirts. They enjoyed the other project so much, why not join forces and make another? Then a friend asked them to make a quilt with their running shirts. After these projects were complete, they knew they wanted to make more of these quilts. They loved seeing how happy the people were seeing all of their shirts in a great quilt. And bottom line, they were a great team and this was something they could do together wherever they are! Besides working together in their studio, Tom and Michele love spending time at their house in Myrtle Beach. While there, they love walking and reading on the beach, bike riding and, of course, golf! They're also head over heels in love with their newest addition to the McColligan house, Stella Blue. She was thrown from a car while pregnant, but now enjoys a life of leisure and lots of sleeping. She's unbelievably adorable and is obsessed with Tom. Fill out the form with any questions you may have. You can also email me directly at [email protected] . We'll be in touch within 24 hours.